It was the glory of the great Saint Wilfrid to fasten securely the happy links which bound England to Rome. He was born about the year 634 of an excellent Christian family; at that time a brightly burning torch was seen over the house of his father, shedding light all along the street where the house was, without doing any damage. This was regarded as a presage that the newborn babe would one day be a brilliant light in the Church. 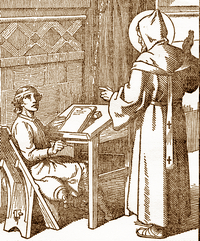 Wilfrid was brought up by the Celtic monks at Lindisfarne in the rites and usages of the British Church. Yet even as a boy Wilfrid longed for perfect conformity with the Holy See in discipline as well as in doctrine, and at the first opportunity he set out for Rome. When his devotion and his desire for instruction in the difficulties of the liturgy were satisfied, he was ready to return to England. On his way he visited the archbishop of Lyons, Saint Chamond, who had very kindly received him on his route to Rome. Before re-embarking for England, Wilfrid received the tonsure and remained with him for three years, until his death. At home once more, he built a monastery at Stamford, and made of another one at Ripon a strictly Roman monastery under the rule of Saint Benedict. There he was ordained a priest, and after having governed it as Abbot for five years, he was consecrated a bishop in France. He again remained for a time across the Channel, and then found, when he returned to England, that another had replaced him in his newly assigned see of York. That bishop, whose position was more than doubtful, was persuaded to retire when the Archbishop of Canterbury visited Northumbria; Wilfrid was thereby reinstated in 669. He enforced the Roman obedience in his see and founded many monasteries of the Benedictine Order. As Bishop of York he had to combat the passions of wicked kings, the cowardice of worldly prelates, the errors of holy men. He was twice exiled and once imprisoned; finally the difficulties were settled with the aid of Roman authority. In 686 he was called back to his diocese of York, where eventually he swept away the abuses of many years and a too national system, and substituted instead a vigorous Catholic discipline, modeled and dependent on Rome. When the large see of York was definitively divided and suffragan dioceses established, Saint Wilfrid was given two smaller sees but not York. He decided to accept the settlement reached with other British ecclesiastics, since the principle of Roman authority had been vindicated. He died October 12, 709, amid the monks of Ripon and was buried in this monastery. A monk of the monastery of Ripon who had worked with Saint Wilfrid for forty years wrote the first biography of the former Abbot and Archbishop. The greater part of his relics were transferred to the cathedral of Canterbury in the year 959. Reflection: Trust in the Vicar of Christ is an instinct planted in us for the preservation of the Faith. It follows necessarily upon the reign of our Saviour's divine love in our hearts. Les Petits Bollandistes: Vies des Saints, by Msgr. Paul Guérin (Bloud et Barral: Paris, 1882), Vol. 12; Little Pictorial Lives of the Saints, a compilation based on Butler's Lives of the Saints and other sources by John Gilmary Shea (Benziger Brothers: New York, 1894); The Catholic Encyclopedia, edited by C. G. Herbermann with numerous collaborators (Appleton Company: New York, 1908).